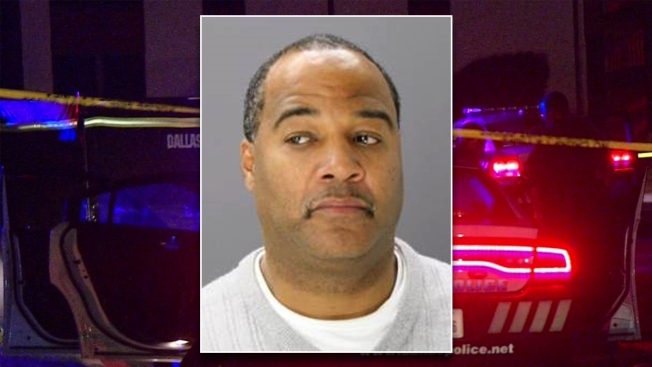 Dallas police arrest 55-year-old Donald Moon (inset), who they say confessed to fatally stabbing his father and wounding his mother Dec. 31, 2016. A 55-year-old man is facing charges after his mother told police he stabbed her while fatally stabbing his father during an argument last month. Dallas police said neighbors requested a welfare check on New Year's Day for an elderly couple who live at a home on the 1600 block of East Redbird Lane after noticing uncollected newspapers in the yard. Police arrived, entered the home and found the 83-year-old Choyce Moon in a chair, "deceased from homicidal violence," and his 80-year-old wife, Mae Francis Moon, injured in the bedroom. Mae Moon was transported to Baylor University Medical Center in Dallas for treatment. While recovering, she told police her son — Donald Moon — had stabbed her when she tried to intervene in an argument between him and his father. She said Donald Moon also stabbed his father several times. Police said a tip and the help from U.S. Marshals led to the arrest of Donald Moon near downtown Dallas at about 5 p.m. Wednesday. Investigators said Donald Moon waived his right to remain silent and confessed to the attacks during an interview at the police station. Donald Moon has been charged with murder and aggravated assault and is being held on $600,000 bond, police said.